Senior academics from the Institute of Education (IoE) have travelled to China to see students graduate from the University of Reading MA (English Language Education) programme at Guangdong University of Foreign Studies (GDUFS). Addressing the new graduates, Professor Jeanine Treffers-Daller of the IoE urged them to make full use of their new knowledge and skills. She added that through their shared experience, as well as their degrees, they will have gained a depth of knowledge and friendship with teachers and students that would be a foundation stone for their future. 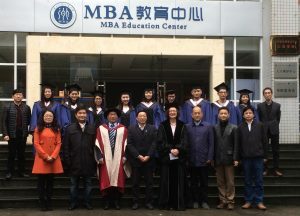 The IoE has worked hard with his counterparts in China to link the two universities across the continents, resulting in the 2013 launch of the MA programme. Increasing numbers of students from many different provinces of China enrol each year and there has been great enthusiasm and commitment from all sides. This year’s graduation was a happy celebration. Fostering international talent is an increasing feature of higher education. The Institute of Education has keen eyes on the global horizon and places enormous value on its strong and growing links with China. The IoE is particularly proud to have forged such a productive partnership with the esteemed Guangdong University of Foreign Studies, which is among the top three specialist foreign language institutions in China. First row: Professor Zhang Xin (Deputy Dean of FELC), Mr Wang Bin (Administrative Dean of FELC), Dr Daguo Li (Award Leader, Reading), Professor Li Yunming (Vice-President, GDUFS), Professor Treffers-Daller (Award Leader, Reading), the Dean, Professor Wen Binli, Mr Yi Zongying (Deputy Director of International Office), Professor Zhao Chen (Deputy Dean of Graduate School, who is also teaching on the award). Second Row: Dr Wang Yunfeng, course coordinator in Guangdong, left, and course administrator, Mr Zheng Changqing, on the far right. The University of Reading is ranked as one of the top 1% of universities in the world. The University has a particular strong tradition in applied linguistics and language education. It was on the Advisory Board for the development of Chinese College English Test (CET) Band 4 and Band 6 and has been supporting English language teaching in China over the decades. The IoE is one of the largest and leading providers of teacher education and educational research in the UK. Many of its graduates soon become leading figures in their respective schools. The Faculty of English Language and Culture (FELC), Guangdong University of Foreign Studies, is renowned both nationally and internationally for its research in linguistics and applied linguistics. It is the only nationally designated Research Centre for linguistics and applied linguistics in China. It leads South China in the research of foreign languages and cultures, overseas economy, trade and international strategies.